People talk about how Republicans are energized by the primary elections this year, but enthusiastic Mesa County Democrats also flocked to caucuses in far larger numbers than in past years Tuesday night to choose between Hillary Clinton or Bernie Sanders for nomination for President. A Democratic caucus held at Pomona Elementary School at Patterson and 25 1/2 Roads in Grand Junction was almost standing room only, a sharp contrast to a few years ago when hardly anyone turned out. 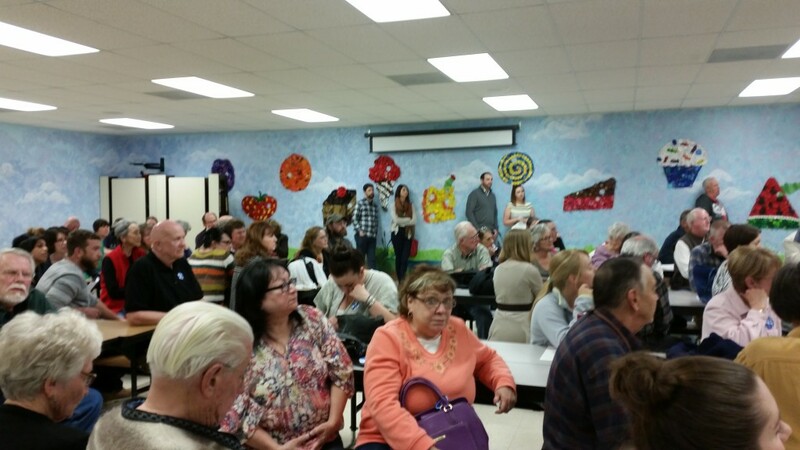 The Pomona caucus comprised two precincts and drew around a hundred attendees. Organizers were astounded at the large turnout, contrasting it with the turnout for the last caucus they organized in the same place just two years ago, when only three people turned out — the people who organized the caucus. In other words, no one showed up. It was a vastly different story tonight. Not only do there appear to be more left-leaning residents in the area now, but they also appear to be motivated to make a difference. Participants talked about the urgency of making sure another Democrat is elected to the White House in November. Most expressed alarm and great concern over what they’ve been seeing in the Republican race for the nomination. Participants also expressed relief and gratitude that for once they have two excellent candidates to choose from for president. Democrats at the caucus at Pomona Elementary School favored Bernie Sanders over Hillary Clinton by a close margin, mirroring the result in the state as a whole. The other half of the room at Pomona Elementary…standing room only! At Appleton, my husband met a long time Republican couple, now Democrats. They were split, one for Bernie, the other for Hilary. Times are a changing in Mesa County!